Oakland A’s reliever Pat Venditte may be able to throw with either hand, but he can’t pitch underwater. Although switch-hitters (players who can bat both left- and right-handed) are not uncommon, pitchers who can throw with either hand are a rarity. Being able to throw a baseball hard and accurately with either hand requires a much greater level of ambidexterity than switch-hitting does, and even the relative handful of players who are capable of the former typically don’t use that ability at the higher professional levels — it’s generally thought better for a pitcher to use only his dominant arm than to switch back and forth between sides. In fact, in the modern era only one pitcher prior to 2015 had faced batters throwing as both a righty and a southpaw in the same game, and that event was something of a gimmick: During a game at the tail end of the 1995 season, the Montreal Expos’ Greg Harris, who was just about to retire after 15 years in the majors, threw pitches with both hands during the next-to-last game of his career. 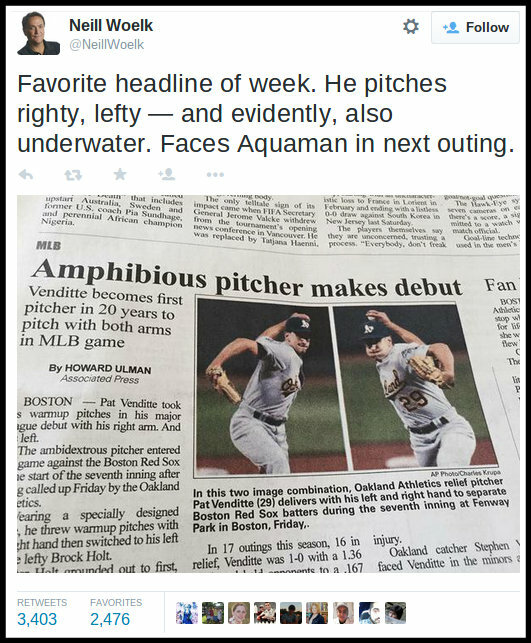 We reported on the young amphibious — ahem, ambidextrous — pitcher recently called up by the Oakland Athletics. Sure, we’re a little red in the face. It’s one thing to have a slip of the tongue, it’s another to put a mistake into print, and it’s still another to see that mistake splayed across the world wide web. And to think: Just a few weeks ago we were Internet heroes, showing the courage and temerity to publish a letter about farts. Now, we’re lowly Internet zeros, publishing unconsciously about frogs. It’s certainly not the first time we’ve picked up an EO and seen a mistake, from the wrong use of a word to improper grammar to just a plain old typo. For regular readers of any newspaper — a community monthly where one person does all the work, or the Wall Street Journal where an entire department pores over every page looking for goofs — a printed mistake is not uncommon. That’s the nature of words and deadlines and the lack of a delete button once that mistake has been pressed in ink. No excuses. We’ll own it. It was a dumb mistake and it got through, from our desk to the press to the web. Surely we’ll hear plenty about it in the coming week. Then it will die down, life will go on and we’ll give those proofs closer looks. Nights waking up in a cold sweat? They aren’t going anywhere anytime soon.